Van Cleef & Arpels has always been that luxury house that’s most associated with flora and fauna, with many of its fine and high jewellery pieces featuring various motifs. And taking inspiration from its La Boutique Animal Clips collection that was launched back in 1954 that was favoured by the likes of HRH Princess Faiza of Egypt, Grace Kelly and Jackie Kennedy Onassis, it returns today as a series of pieces known simply as Lucky Animals, comprising 9 different animals that feature Van Cleef & Arpels’ genius use of polished stones set within a contour of golden beads. 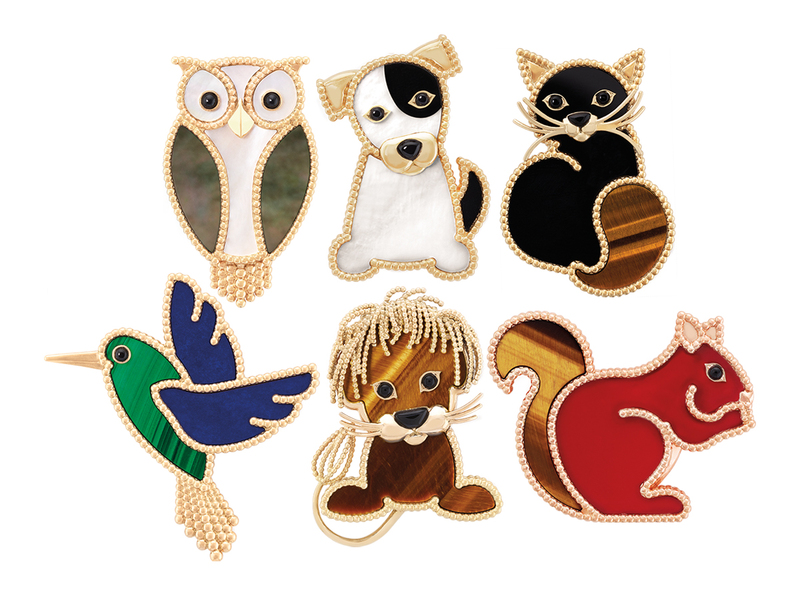 Designed to be worn as clips on most any outfit, each animal comes with deep onyx eyes, featuring different coloured stones assembled in marquetry to form the body that matches their respective personality, from the use of tiger’s eye that creates the look of golden fur as seen on Cat’s (and Squirrel’s) tail. Grey mother-of-pearl adorns Hedgehog and the wings of Owl, while white mother-of-pearl provides a precious sheen on Dog and Dove, for example. Carnelian, on the other hand, gives Squirrel an added pop of colour with lapis lazuli and malachite making for the perfect shades of blue and green on Hummingbird. Van Cleef & Arpels has always been known for its expertise in hard stones and mother-of-pearl – the French maison only chooses stones with bright and even colour. Handed over to the artisans who will cut and craft the pieces with precision and perfection, they are then polished to create a brilliant shine. In the case of the Lucky Animals collection, the various stones are then placed and set in marquetry, before they are framed within the contoured bead case that’s reminiscent of the Maison’s signature Alhambra motif. And if you’re set on picking yourself a piece from the collection, these cute critters are now available in Singapore at Van Cleef & Arpels ION Orchard where they are priced between SGD8400 and SGD10,200 each.